and Physics "Ennio De Giorgi"
It introduces master, Ph.D. students and postdocs to subjects related to functional analysis and evolution equations. As usual, the course consists of three phases. Phase 1 (October-February) The organisers provide a weekly lecture via the ISem website. The participants are expected to study the lecture notes, to solve the proposed problems, to post their remarks and questions in the website, and to post the solutions of the problems, in turn. Participants belonging to the same institution are encouraged to collaborate, possibly under the supervision of a senior local coordinator. Phase 2 (February-May) The participants form small international groups to work on various projects which supplement the theory of Phase 1 and provide some applications. Each group is coordinated by a senior mathematician who provides bibliographical material and help. 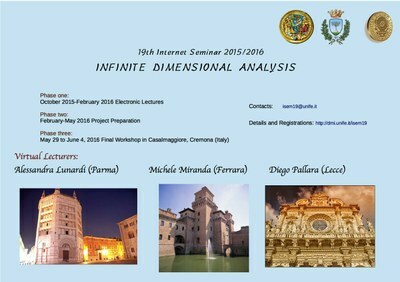 Phase 3 (30 May-4 June, 2016) A final one-week workshop will be held at Istituto Santa Chiara, Casalmaggiore, Cremona (Italy). There the teams will present their projects and some additional lectures will be delivered by leading experts. We expect from the participants basic knowledge in functional analysis, foundations of Hilbert spaces, and some familiarity with partial differential equations and measure theory. Knowledge of probability theory and stochastic analysis may be of help but it is not essential. Participants should register filling the Registration form in this webpage. Registration is free. You can find here the list of registered users.